Your Product-Key is printed in the white box at the bottom of your product DVD. Have a look at the pictures to the right to see where the Product-Key is located. Your Product-Key has a total of 20 characters and is divided into 5 blocks of 4 characters each. The dash sign ‘-’ is not part of your Product-Key. Valid characters are the letters A to Z and the digits 0 to 9. It is 8 characters long and can contain the letters A to F and the digits 0 to 9. The picture on the right shows you where your Serial Number is located. In this new window, fill in your 20 character Product-Key and your 8 letter Serial-Number. Once you are finished click on the “Download License File” button. Your browser will then download a license file. Note: Please do not rename this License File, especially do not change the extension .LIC to something else. If you are using Windows Vista or Windows 7 aerofly5 is installed in the user directory. 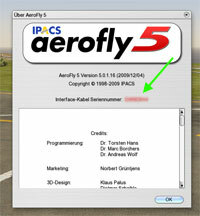 To open this directory, right click on the aerofly5 icon on the Windows desktop and click on “Open file location”. This completes the activation via web interface.